I think there’s a frog, or possibly 10, under the futon in our yurt. With an ear cocked like a kid trying to detect a monster in the closet, I tiptoe across the hardwood floor trying to home in on the chirping. From the moment we arrived at Falling Waters Adventure Resort’s yurt village [10345 U.S. 19 W., 1-(800) 451-9972] west of Bryson City, a boisterous gang of frogs have been putting on a concert, so it seems entirely feasible that a tiny green guy is kicking back in our tent-like abode. I never found him, but we wouldn’t have minded sharing the space. The accommodations, with beds, community bathrooms, and a hot tub, are more cushy than a campground, but still qualify as roughing it. And the village is a great base from which to explore the Nantahala Gorge, and its northern neighbor, Great Smoky Mountains National Park. With abundant opportunities for rafting, hiking, biking, and horseback riding, it’s impossible to run out of outdoor activities here. Yurts are beyond popular in the Northwest—the ones we’re staying in were made in Portland—but they originated in Central Asia. Lattice frames and watertight shells create circular rooms that are big enough for three or four people with space to spare for a toad. 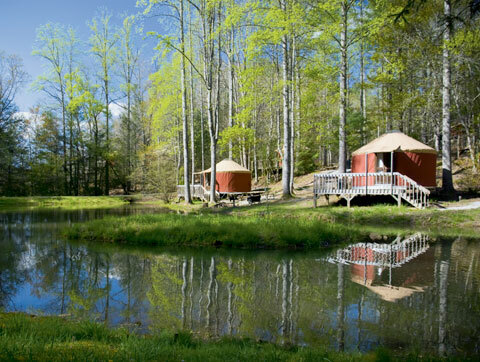 Eight yurts, each with a deck, are scattered on a hillside next to a pond and hiking trails leading to Lake Fontana. The place has the feel of a summer camp for grown-ups and families. When you call for a reservation (book Yurt 8 for a stellar view), you can also sign up for a raft trip on the beginner-level Nantahala River or a waterfall tour in a Jeep with Wildwater Ltd. [1-(866) 319-8870], the company that manages the resort. If you prefer more posh quarters, check in at Nantahala Village Resort & Spa [9400 U.S. 19 W., 1-(800) 438-1507] or one of the resort’s many cabins that range in style from rustic to contemporary. On the property, you can hop in the saddle for a trot; pedal six miles of trails on a mountain bike; zone out during a river rock massage; or lounge by the pool, occasionally rousing for a game of shuffleboard. Kids will happily abandon Nintendos for the game room, complete with air hockey, pool tables, and ping-pong. For breakfast, lunch, or dinner, dine at 13 Moons restaurant inside the arts and crafts-style lodge. Fuel up on carbs and protein with the beef tenderloin hash. Nantahala Outdoor Center [13077 U.S. 19 W., 1-(888) 905-7238] started as a small rafting operation in 1972 and evolved into a launch spot for multiple adventure sports. Any gear you forgot to pack, including your kayak, can be purchased at the Outfitter’s Store. Essentials including camp stoves, biking and boating helmets, and paddles share the two-story shop with fashionable yet functional Keen flip-flops, bungee dog leashes, and even sundresses. The bridge that cuts between the restaurant next door and outfitter’s shop is part of the Appalachian Trail, so technically, if you cross the river, you can claim you’ve traversed part of the legendary footpath. At River’s End Restaurant, grab a seat by the windows or on the covered patio and watch rafters disembark. You can tell by their expressions whether they had a triumphant or bumpy ride through the biggest and last rapid, Nantahala Falls. Snack on smoked trout dip, or fill up on Sherpa Rice, an ample helping of jasmine rice, lentils, and barley topped with cheddar, and a choice of veggies, chicken, or chili. If you’re in training for an eating contest, end with the Cool Jewel, a softball-size scoop of vanilla ice cream rolled in granola and drenched with caramel and chocolate syrup. For years, Lakeview Drive, aka the Road to Nowhere, has created a divide between locals who want the route, which dead-ends in Great Smoky Mountains National Park, to be finished and those who believe the best alternative is to leave it be and accept a settlement from the federal government for lost tourism and other harms. All that aside, most can still appreciate the beauty of this eight-mile route that resembles an outtake from the Blue Ridge Parkway, with lookout points revealing impressive vistas of Fontana Lake and mountain peaks. Trails along the route include Noland Creek, a popular track for horseback riding and hiking, with picturesque campsites. Even if you’re short on time, walk down to the footbridge on the right for a calm pause over the rushing creek. Reservations and permits for overnight camping are required [www.nps.gov/grsm]. The end of the road, literally, is marked by a tunnel. Once you turn off your engine in the parking area, a quiet you only find in the wilderness settles in. From here, hoof it through the tunnel. It’s at the halfway point through the dark passage that you begin to wonder if you’re really moving forward. The light on the other side seems to recede with each step, but don’t be discouraged: You’ll be rewarded with hiking trails on the opposite side. Back in town, trains depart the Great Smoky Mountains Railroad Depot [226 Everett St., 1-(800) 872-4681] for Nantahala Gorge every day from late March through October. Wildwater Ltd. and NOC offer raft and rail combination packages. Guests catch the early train and are dropped off with guides once they reach the river. After the trip, folks enjoy lunch before returning to town. For the full railroad experience, stay in the GSMR’s Presidential Suite overlooking the depot and visit the train museum across the tracks. The Stecoah Valley Cultural Arts Center [121 Schoolhouse Rd., Stecoah, (828) 479-3364] may be small, but the performance venue and gallery scored big names for this summer’s An Appalachian Evening concert series—chief among them, bluegrass giants Doc Watson and David Holt. Tickets for the August 8 concert go on sale in June. Get there early to admire and purchase the pottery, paintings, weaving, and other pieces created by members of the Stecoah Artisans Guild. The raku and horsehair vessels by Hounds Hollow Pottery [1262 Tobacco Branch Rd., Almond, (828) 479-1007] are among my favorites. The work of another artist, poet Joyce Kilmer, who penned the famous work Trees in 1913, is aptly commemorated in a namesake virgin hardwood forest [Off U.S. 143, (828) 479-6431]. Along the easy two-mile loop near the parking area, you can spy some of the oldest trees, which top 100 feet. And with some of them 20 feet in circumference, you could play a pretty challenging game of hide-and-seek with your friends. Save the toughest and most exciting excursion for last—the Cheoah River. Groups who yawn during the rapids on the Nantahala get their thrills during this Class IV-V ride. “The big difference we’re talking about is a serious rafter with the desire for an adrenaline rush versus a family vacation,” says Ken Kastroff, co-owner of Endless River Adventures [14157 U.S. 19 W., 1-(800) 224-7238]. Because of limited water release dates from Cheoah Dam, the trips are only offered on certain weekends (June 20 or 21 this year). If you’ve never rafted a Class-IV river, or are younger than 16, you can’t join the paddling crew. But that’s a good excuse to hit some other rivers like the nearby Ocoee (Tennessee) or Chattooga (Georgia) in training for your visit next year.